Please call the car park 40 minutes before you arrive at the Luton airport short term car park meet and greet parking area where you will be met by a member of the Car Park Team. You will be shown a parking ID and paperwork for your car which will have to be checked and signed by yourself. The car will then be taken to a secure compound leaving you free to proceed to the terminal for check in. Customers are advised to allow sufficient journey time to arrive at Luton Airport at the meeting time that has been designated by the customer. If the customer misses their booking time they will incur additional costs. The customer must ensure they contact Easy Parking and advise of any changes as soon as possible. The responsibility to arrive on the agreed time is the customers. Easy Parking cannot be held responsible for any costs or inconvenience incurred when not following the instructions provided by the company. We reserve the right to change late meet and greet customers to park and ride. On your return please call the car park when you arrive in the baggage hall, this will allow ample time to ensure your car is waiting for you at the collection point outside the terminal building. 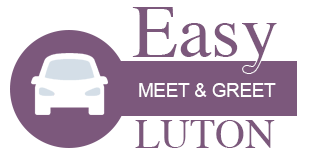 Easy Parking will take the stress out of finding a parking space at Luton Airport as they are only a 1/3 mile from the main terminal building. Easy Parking operates a secure compound with barriers and CCTV.